Here are my top picks for the best weighted piano keyboards. They offer the same touch and feel as acoustic pianos, and they come with numerous benefits. There are many advantages to buying a digital keyboard over an acoustic piano. If you’ve decided to purchase a keyboard, you should strongly consider buying one that’s weighted. These types of digital pianos are designed to feel and sound the most like acoustic pianos, with the touch of the keys having a feeling similar to the touch of the keys of an acoustic piano. But how can you know which is the best fully weighted keyboard? Whether you are a beginner or advanced pianist, or if you need something with a ton of diversity, there are so many types and varieties of weighted keyboards available. The Alesis Recital 88-Key Beginner Digital Piano/Keyboard is my choice for best keyboard with weighted keys for beginners, as well as for best weighted keyboard under $300. Why is this the perfect weighted keyboard for beginners? First, it mimics the keyboard of an acoustic piano with its 88 full-sized semi-weighted keys. The response you’ll get when touching these keys is amazingly almost exactly like the response you’d get when touching the keys of an acoustic piano. It also comes packed full of educational features that will benefit any beginner. Its lesson mode and metronome will help to keep you on track as you’re learning to play the piano. Additionally, this weighted keyboard features a Recital Mode in which you can play simultaneously with your piano teacher or the two of you can take turns playing. You can also customize the sound of the Alesis Recital. Five voices are included: acoustic piano, electric piano, synth, organ and bass. That’s a wide variety of sounds coming from a beginner’s keyboard! The Alesis Recital isn’t huge, weighing in at just over 15 lbs, making it highly portable for those who desire that quality in a weighted keyboard. It also runs on batteries or AC power. It is connectable to a computer or digital audio workstation via USB. The back of the keyboard has a Stereo RCA output that allows you to plug into any speaker system or amplifier with an AUX or RCA input. Those preferring a bit of privacy while they play will appreciate the 6.35 mm audio jack designed for headphones. Why is this the best weighted keyboard under $300? At a price point of just over $200, the Alesis Recital isn’t just for beginners, but is designed for anyone looking for a quality weighted keyboard on a budget. 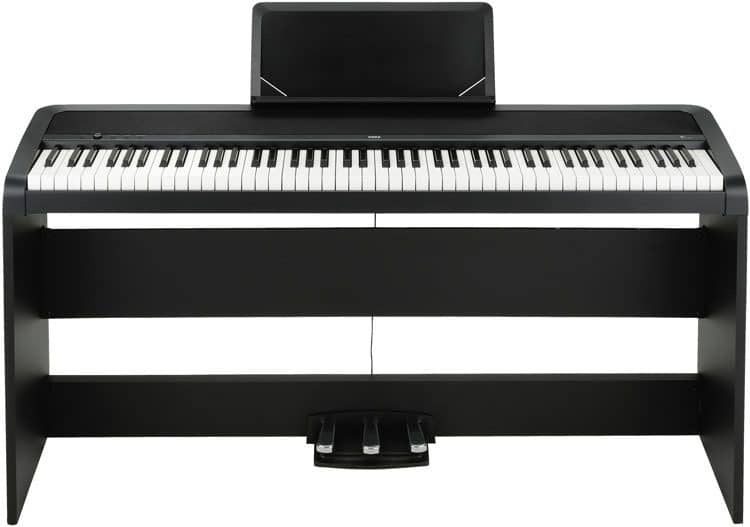 If you have a bit more to spend, you can purchase the Alesis Recital Bundle, which includes an adjustable keyboard stand, padded seat and sustain pedal, for just under $300. Yes, the volume is adjustable on most models. Keep in mind that the volume might not be the same as what you’re used to hearing from an acoustic piano, however. (See above) - The Alesis Recital 88-Key Beginner Digital Piano/Keyboard is, in my opinion, the best weighted keyboard under $300. In addition to being the best weighted keyboard for beginners, if you are on a budget, this is perfect for you. For just under $300, you can purchase the Alesis Recital Bundle, including an adjustable keyboard stand, padded seat and sustain pedal. If you have a bit more money to spend, you can acquire the Casio Privia PX-160 Digital Piano. This is the best weighted keyboard under $500, in my opinion, and is another full-sized, 88-key weighted keyboard that uses Casio’s Tri-Sensor Scaled Hammer Action II keyboard. This amazing keyboard utilizes simulated ivory and ebony keys for a real authentic touch and feel. The sensors in this keyboard provide lifelike dynamics that mimic those of an acoustic piano. The Casio Privia PX-160 also features the AiR (Acoustic and intelligent Resonator) sound source patented by Casio. This gives the digital piano its grand piano sounds. It also helps to control the Damper Resonance when the keyboard’s damper pedal is pushed. This weighted keyboard also features an 8w x 8w speaker system, providing rich sound that can be projected outwards toward the audience instead of downwards like most digital piano speaker systems. In addition to incorporating real, lifelike grand piano sounds, the Casio Privia PX-160 also features new sounds including string and harpsichord. The keyboard also features split and layer capability that allows you to play bass with the left hand and two-layered tones with the right hand. Included within the keyboard is a two-track recorder to record and play back performances. Two headphone outputs are included on the front of the PX-160, as well as left and right line outputs in the rear. It is also connectable to Mac or Windows computers via USB. Additionally, the PX-160 can be used as a MIDI controller with the Apple iPad. The keyboard itself is priced just under $500. If you opt to purchase the sustain pedal, bench, keyboard stand, and headphones, you’re looking at a price tag just under $600. In my opinion, the best portable weighted keyboard is the Yamaha P-125 88-Key Weighted Action Digital Piano. What makes this the best in its class? This digital piano is designed to be used anywhere, being highly portable at just 20 lbs. It provides some of the truest, most authentic sounds that you’ll ever hear coming from a digital piano, mimicking the sounds of a nine-foot concert grand piano. In addition to its natural acoustic piano sound, the Yamaha P-125 is simple and user-friendly, designed for beginners as well as advanced pianists. Its 88 weighted keys give it the perfect touch and feel, using Graded Hammer Standard (a standard that provides a lighter touch in the higher end and heavier touch in the lower end, just like the touch and feel of the keys of an acoustic piano). Additionally, the Yamaha P-125’s two-way speaker system provides it with an authentic acoustic piano stereo sound coming from two directions. This provides a more true-to-life sound, especially during performances. If you’re into the latest technology, you’ll be happy to know that Yamaha’s free Smart Pianist App on your smartphone can pair with the Yamaha P-125. This handy app allows you to control settings, rhythms and voices directly from your phone. At a price point right around $600, this keyboard won’t require you to break the bank to buy it! If you’re a professional, you can’t beat the Roland JUNO D-S88 Lightweight 88-Note Weighted-Action Keyboard with Pro Sounds, which is, in my opinion, the best weighted keyboard for gigging. This gig-ready instrument does weigh a bit more than most portable keyboards, at 43.5 lbs, but the strain your muscles might undergo transporting it from place to place is worth it for its superior quality, performance features and sound. This 88-key weighted keyboard incorporates Roland’s Ivory Feel-G Keyboard action, providing a weighted-key feel in a fairly lightweight, easily transportable keyboard. The Roland JUNO D-S88 is the best digital piano for advanced pianists and includes a wide array of sounds including electric piano, organ and acoustic piano, as well as over 600 sounds and waveforms from the EXP-06 Studio Collection. Interested users can also download over 1000 sound waveforms for free from Roland’s Axial website via the wave expansion slot. The sample import function of this keyboard allows you to play WAV files as well. The keyboard’s hands-on controls, knobs and sliders make editing and customization of your music a breeze. Phrase pads enable you to trigger sounds and samples stored on USB memory with the touch of a button. The JUNO D-S88 also includes a mic input for performers, vocal reverb, and auto pitch abilities for those who like to vocalize along with their keyboard performances. The eight-track pattern sequencer in the JUNO-D-S88 allows you to capture new ideas and develop them on the go. In this way, your live performances can be enhanced through utilizing features such as looping and backing music. With a price point around $1000, the Roland JUNO D-S88 is not designed with the budget-conscious in mind. However, it is perfect for performers who are looking for the ultimate keyboard. My choice for the best weighted keyboard overall has to be the Korg B1SP 88 Weighted Key Digital Piano. Why? The 88 natural weighted keys of this digital piano make it the ideal choice for beginners as well as advanced pianists, and it won’t bust your budget at a price just under $600. The overall feel and sound quality of the Korg B1 simulates that of a traditional, acoustic piano, imitating the sound of a grand piano. With eight digitally sampled sounds and 120 voices, you can also make the Korg sound like other instruments, including a harpsichord and two different types of organs. Korg’s Motional Feedback technology gives this weighted keyboard realistic sound reproduction. Additionally, a three pedal unit is included to further mimic the sounds of an acoustic piano. A headphone jack in the back makes it easy to play just for yourself if that’s your preference. At 70 lbs, the Korg B1 is just a bit heavier than many portable keyboards, so keep that in mind if the instrument’s weight is a consideration in your purchasing decisions. If you are searching for a digital piano that produces sounds like those of a genuine grand piano, you can’t do better than the Korg B1. The price point just under $600 includes the piano, piano bench, and music stand. Why is a Weighted Keyboard Better than a Non-Weighted Keyboard? Many musicians, myself included, believe that a semi-weighted or fully-weighted keyboard is better than a non-weighted keyboard. An electronic or digital piano with weighted keys has the touch sensitivity and feel of an acoustic piano. 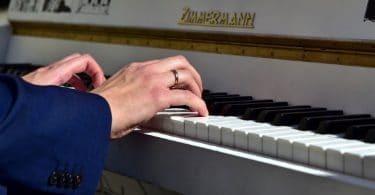 Especially if you’ll be moving from playing an acoustic piano to a keyboard, or back and forth from one to the other, a weighted keyboard will have the feel to which you’ve grown accustomed. Additionally, weighted keys are better for building strength in your fingers if you are a beginner. A non-weighted keyboard, on the other hand, provides no resistance when you press its keys, and is similar to the feel of a computer keyboard. One attraction of non-weighted keyboards that some users like is that a non-weighted keyboard is, obviously, lighter in weight. If you’re going to be transporting your keyboard from one place to another often, you might want to take this factor into consideration. Once you have become a more advanced pianist, I encourage you to play around with both types of keyboards, weighted and non-weighted. See which one you prefer. If you’re into creating your own music, you might opt for the computerized feel of the non-weighted keyboard. The non-weighted keyboard feels more like a MIDI controller, if you’re used to playing on those. Beginners, however, will likely have an easier time learning to play on a weighted keyboard. For those who know absolutely nothing about weighted (or non-weighted) keyboards, don’t feel bad! Many people don’t even know that there is a difference between non-weighted or weighted keyboards. Others don’t know the differences between acoustic pianos and digital pianos. Here are some frequently asked questions that might help to answer some of your queries, about playing and purchasing weighted keyboards. Why should I buy a weighted keyboard as opposed to a non-weighted keyboard? This has been discussed earlier. To reiterate, a weighted keyboard has the touch, feel and key responsiveness of a traditional, acoustic piano. Many music purists prefer weighted to non-weighted keyboard for this reason. Why should I buy a weighted keyboard/digital piano over an acoustic piano? This choice mainly comes down to personal preference and your budget. Digital pianos/weighted keyboards are usually much less expensive than acoustic pianos. They are also easier to move around, as they are lighter in weight than acoustic pianos. The newest weighted keyboards sound just like acoustic pianos and, as another advantage, don’t need tuned like acoustic pianos do, so they require less maintenance. Why should I buy an 88-key weighted keyboard over a 61- or 76-key weighted keyboard? An 88-key weighted keyboard has the same number of keys as a traditional acoustic piano and should be easier for you to learn to play on, as all the keys you’ll ever need will be available. The 61- and 76-key weighted keyboards don’t have the authentic piano feel, despite their weighted keys. Sometimes, these smaller sizes of keyboards aren’t even available in weighted models, only in non-weighted models. Do weighted keyboards typically come packaged with accessories? No, usually accessories such as a piano bench, keyboard stand, and headphones must be purchased separately. Sometimes, however, you’ll find a deal on a bundle package that will include all of these items. Check carefully as you are comparison shopping if you’re looking for a bundle deal. Do all weighted keyboards incorporate sounds of other instruments? Not all keyboards have sounds of other instruments, but most do. Check the specs when you’re comparing weighted keyboards to make sure the one you purchase incorporates the sounds of the instruments you desire. You can usually play sounds including grand piano, organ and harpsichord on most weighted pianos. Others will incorporate string and synth sounds as well. Do most weighted keyboards have a headphone jack? Yes, but again, check the specs when you are comparison shopping just to make sure. Are all weighted keyboard stands sized the same? No. If your weighted keyboard does not come with its own stand, make sure you find one that is either specially designed for your keyboard or fits your keyboard (be sure to check your keyboard’s measurements against the measurements of the keyboard stand). Do all weighted keyboards have built-in speakers? No. Check the specifications when you are comparison shopping, as not all keyboards come with built-in speakers. You must purchase auxiliary external speakers separately for some models and plug them into the keyboard’s AUX jack. Are various colors of weighted keyboards available? Yes, but not many. Most models of weighted keyboards are available in white or black only. Do I need a keyboard carrying case if I plan to transport my weighted keyboard? Yes. Having a special case for transportation of your weighted keyboard is highly recommended to protect your valuable instrument. Is the volume adjustable on a weighted keyboard? Yes, the volume is adjustable on most models. Keep in mind that the volume might not be the same as what you’re used to hearing from an acoustic piano, however.